Sunday, April 19, 2015 Monday, January 23, 2017 John SnydersComments are off for this post. 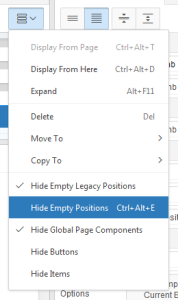 Today I’ll show you how to add keyboard shortcuts to your APEX 5.0 application so that pressing a key combination will navigate to a specific page. For example you could have Ctrl+Alt+D bring you to your “dashboard” page from any other page in your app. You may have noticed that the Page Designer supports a number of keyboard shortcuts. 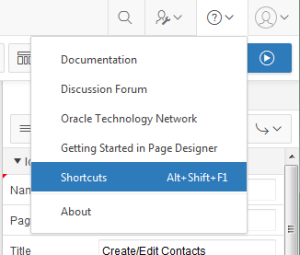 To see a list of shortcuts click on the Help menu or press Alt+Shift+F1. All the shortcuts are for navigating around or performing some action in the Page Designer. The shortcuts are also shown where appropriate in popup menus such as the Grid Layout Menu. This is far more complex than what you’ll be implementing today but I wanted to give a little background so you know that there is more going on than a simple keydown event handler. Enough background, lets get started. Step 1. 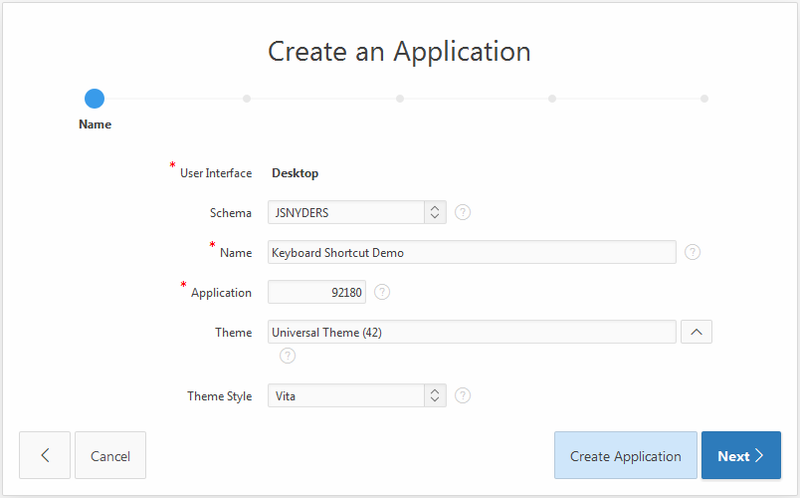 Create a new application using the Universal Theme. 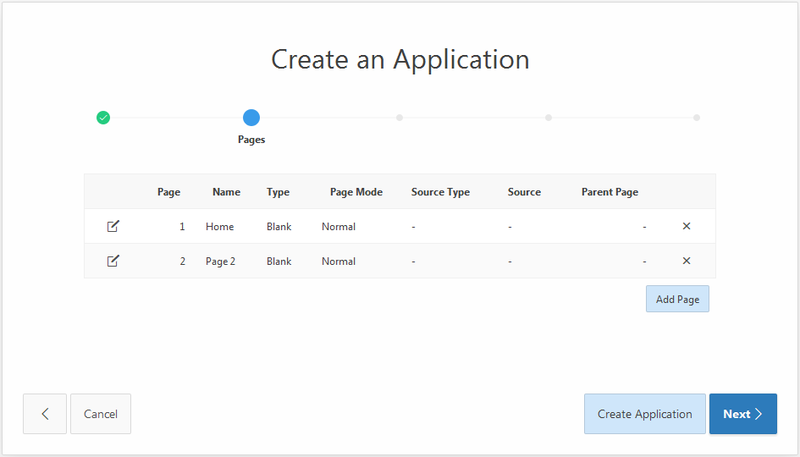 Click Application Builder menu. Click Create. Click Desktop. Name the application Keyboard Shortcut Demo. Click Next. The home page will be the page to navigate to with a keyboard shortcut. Now add another page so we have some other page to navigate from. Click Add Page. Click Blank and then Click Add Page. Now click Create Application. On the confirmation step click Create Application again. Step 2. If you run the app now you will see that it uses a left side tree for navigation. This is the default but keyboard shortcuts are integrated with the menu so you must switch to top menu navigation. Click Edit Application Properties. Click User Interface tab. Click the edit desktop icon button. In the navigation menu section Change Position to Top and List Template to Top Navigation Menu. Now Template Options appear. Check the Add Actions option. Click Apply Changes. Now if you run the app you will see that it has a menu bar (it looks more like tabs because we don’t have enough pages to create drop down menus). Now if you refresh the application you should see that the warning is gone. Step 4. Finally it is time to add the keyboard shortcut. Click Shared Components. Under Navigation click Lists. The list that drives the navigation menus is called Desktop Navigation Menu; click on it. We want to add a shortcut to navigate to the home page so edit the Home page. The shortcut is defined using the User Defined list attributes. Here is an APEX 5.0 gem that you may not have heard about. In the past if you wanted to know what user defined attributes did you would have to open up the intended list template and dig around. Now you can just click the List Template Attributes button, select the theme and list template and you get a list of attributes. This is provided that the list template author bothered to give the attributes a description. Tip for all the list template authors out there: give your attributes a description. You will thank yourself someday. Click List Templates Attributes. Select Universal Theme. Select Top Navigation Menu. Note that A01 is the ID and A05 is the shortcut key. Close the dialog. All actions are identified with a unique name or id. So for A01 enter go_home. For A05 enter Ctrl+Alt+D. A note about key names. The actions facility is picky about the format of the key names. Modifiers such as shift must be given in this order: Ctrl, Alt, Meta, Shift and match those names exactly. The + character separates the modifiers and the key name. Now go back to page 2 of the app and refresh it to make sure it has all the latest changes. Press Ctrl+Alt+D. You should find yourself on the home page! No matter how many pages you add, as long as the navigation menu is on that page, you can use the shortcut key. One word of caution before you go to crazy with this feature. Unfortunately in web browsers many keys are used by the browser itself. Also there are keys that are used by the operating system. And if that isn’t bad enough browser plug-ins may take over some key combinations. You need to try your best to pick keys that are not used by the browsers or operating systems that your users are using. We thought we did a good job picking the keys for Page Designer but then a Ubuntu Linux user pointed out some keys that weren’t available on that system. I’ll show one more thing that you can do with actions. Recall how in Page Designer there were some actions that could be done using a menu or a button. Once you have defined an action you can invoke it from a button. This is how you turn an ordinary APEX button into an action button. Add js-actionButton to CSS Classes. Add attribute data-action with a value equal to the action id to Custom Attributes. In this case add data-action="go_home". Set Action to Defined by Dynamic Action. The action isn’t really defined by a dynamic action but you don’t want any of the other choices either. Think of Defined by Dynamic Action as “none of the above”. Save and run page 2. You now have a button that will bring you to the home page. Note that it doesn’t mater what label you give this button because if the action already has a label (as it does in this case because it is defined by the menu) then the button will have the same label. In the same way a button and menu can share the same icon (make sure the button Icon CSS Classes has at least the icon type such as “fa”). Here is a demo app that is essentially the same as described here but with icons for both the home page and page 2, keyboard shortcut Ctrl+Alt+2 to go to page 2, and page 2 was added as a sub menu item so you can see that it automatically shows the shortcut key in the menu item label. This shows that top level menu items such as Home never show an icon or shortcut key even if they have them defined but they can still be used by actions.